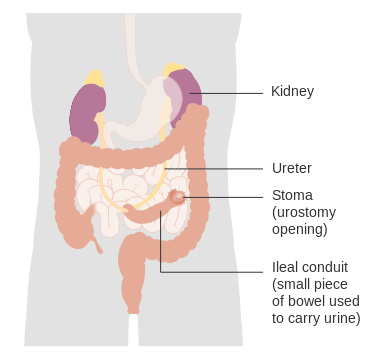 Bladder cancer develops from the lining of the bladder and is the most common tumour of the urinary system. In the UK, it comprises 3% of all cancers cancer types, with the peak age affected being >80yrs and is more common in men than women (ratio 3:1). Fortunately, most diagnosed bladder cancers are superficial (Ta, T1, or CIS) with a good prognosis. It can be divided into several subtypes, including transitional cell carcinoma (most common, 80-90% cases), squamous cell carcinoma (SCC), adenocarcinoma (rare), and sarcoma (rare). The most important risk factors for bladder cancer is smoking and increasing age. Other risk factors include exposure to aeromatic hydrocarbons (e.g. industrial dyes or rubbers), Schistosomiasis infection (specifically causing the SCC subtype), and previous radiation to the pelvis. The most common presenting features is painless haematuria, either visible or non-visible. Patients may also present with recurrent UTIs or lower urinary tract symptoms (LUTS), such as frequency, urgency, or feeling of incomplete voiding. Clinical examination, especially in early disease, is typically unremarkable. If the bladder cancer obstructs the ureteric orifice, features of ureteric obstruction may be present. Those with locally advanced disease may present with localised symptoms, such as pelvic pain, and those with metastatic disease may present with systemic symptoms, such as weight loss or lethargy. All cases of haematuria require complete work-up, as discussed below, to evaluate for potential bladder cancer. Other common causes of haematuria include urinary tract infections, renal calculi, or prostate or renal cancer. All patients with suspected bladder cancer require urgent cystoscopy. 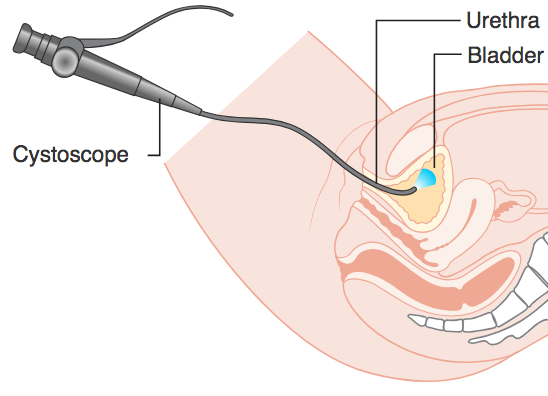 This is typically done initially via a flexible cystoscopy under local anaesthetic. However, if a suspicious lesion is identified from initial cystoscopy, a rigid cystoscopy will be required (typically done under general anaesthetic) for more definitive assessment. Any tumour identified at rigid cystoscopy will require biopsy and potential resection via transurethral resection of bladder tumour (TURBT), either on initial assessment (if appears superficial) or following biopsy results (if appears invasive). 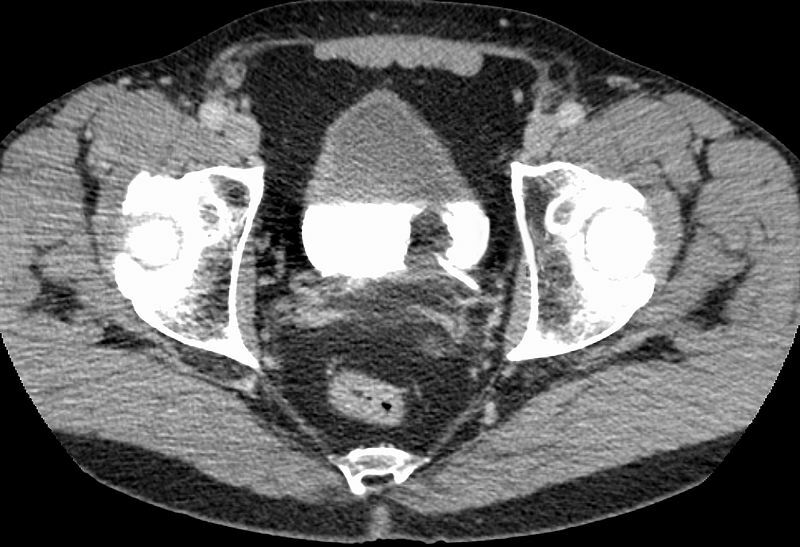 Imaging is also warranted and any suspected muscle-invasive bladder cancer, prior to any resection is performed at TURBT, requires CT staging to be performed. Patients may have already had initial US or CT imaging as part of haematuria work-up, however ensuring complete staging in all suspected cases is essential. Urine cytology can also be sent off, in an attempt to identify cancerous cells in the urine*, however this has poor sensitivity and specificity, hence is not routinely done in all centres. Management of bladder cancer is strongly determined by the classification of the cancer. All cases should be discussed at a specialist multidisciplinary team meeting. Carcinoma in-situ or T1 tumours can typically be resected via TURBT, the mainstay of management. Cases with deemed higher risk disease, even in non-invasive, may require adjuvant intravesical therapy, such as Bacille Calmette-Guerin (BCG) or Mitomycin C. These can be done in the outpatient setting. Radical cystectomy can also be offered to those with high-risk disease or limited response to initial treatments. Unfortunately, superficial bladder tumours have a high rate of recurrence, with around 70% recurring within 3 years, and these recurrences are more likely to be more invasive. Consequently, these patients require routine follow-up with regular surveillance via cytology and cystoscopy. Transurethral Resection of Bladder Tumour (often termed TURBT) involves resection of bladder tissue by diathermy during rigid cystoscopy. Typically, the procedure is performed under general or regional anaesthesia. The biopsy samples obtain can aid in assessing the stage of the disease. Depending on the disease, intravesical treatments may be instilled into the bladder following the procedure. For those fit enough to undergo surgical intervention, most cases of muscle-invasive bladder cancer warrant a radical cystectomy, which involves the complete removal of the bladder. Patients will often also be considered for neoadjuvant chemotherapy, typically with a cisplatin combination regimen. These patients require regular follow-up with CT imaging to monitor for local and distant recurrence. *Alongside routine bloods, B12 and folate levels should also be checked at least annually due to the resection of part of the ileum during the urinary diversion procedures. Patients with locally advanced or metastatic muscle-invasive bladder cancer who are otherwise well should be considered for chemotherapy, typically either a cisplatin‑based regimen or a carboplatin plus gemcitabine-based regime. Any symptoms of the disease, such as pelvic pain, ongoing bleeding, or urinary frequency, should be also be managed appropriately with specialist advice and input through the MDT. Palliative options should also be discussed with the patient when appropriate. Patients who have had bladder cancer are at higher risk of developing upper urinary tract tumours and urethral tumours. Prognosis of the disease is dependent on the disease staging. Patients with superficial disease have a five-year survival between 80-90%, whilst those with muscle-invasive and metastatic disease have rates of 30-60% and 10-15% respectively. For a patient presenting with new visible haematuria, what is the recommended first-line investigations (after routine bloods and urine dipstick testing)? In a patient who has undergone an ileal conduit formation, what is the most likely cause of their macrocytic anaemia? What proportion of superficial bladder tumours have recurred within 3 years?